Smartphone success has eluded Intel for years, but the company’s CEO hopes to reverse its fortunes by drawing lessons from an aggressive strategy that made it a major player in the tablet market. For next year, Intel will set a goal on the number of smartphones that will ship with its chips. Like it did with tablets, Intel will work with partners to develop products and innovations, while also working to bring down the cost of smartphone chips, Intel’s Brian Krzanich told a small group of journalists ahead of the Intel Developer Forum this week. “By November or December, we should be able to set a goal for phones next year,” Krzanich said. Krzanich is trying to reverse years of Intel’s struggles in the smartphone market. The market is currently ruled by ARM, whose processor designs are used in best-selling handsets. ARM also is used in a large number of tablets, but Intel is catching up. But Intel effectively bought its way into the tablet market by selling chips to device makers at subsidized prices. That isn’t a strategy Intel wants to follow with smartphones, Krzanich said. “I don’t want to do that with phones. I would really like to avoid that,” Krzanich said. Smartphone chips like Sofia aren’t expected to be expensive. 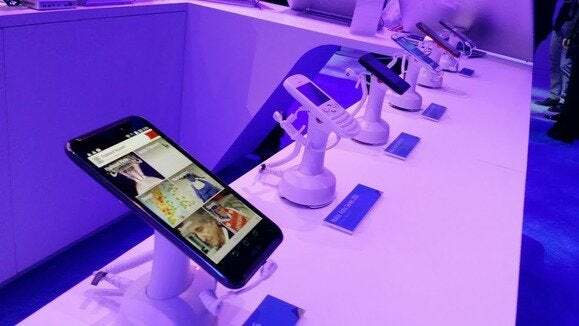 Intel has forged a relationship with Chinese chip maker Rockchip to make Sofia variants for low-cost smartphones and tablets. The first jointly developed dual-core chip will ship in the first half of 2015, and a quad-core version of the chip will follow. Rockchip also makes low-cost chips based on ARM processors. “Sofia wasn’t even a product at this time last year. We’ve not only conceived the product, we’ve got both the 3G and LTE silicon back, both are functional,” Krzanich said. “It’s a product that’s built for the right price point. I’ve got to get those out, get the OEMs in there,” Krzanich said. Intel’s latest smartphone chips include Merrifield and Moorefield, which are made using the 22-nanometer process. New chips lined for next year include an Atom processor code-named Broxton for high-end smartphones.